To celebrate we are hosting a FREE community workshop on October 11 2017. Presented by Angie Demarco. 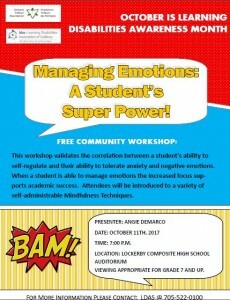 This workshop validates the correlation between a student’s ability to self-regulate and their ability to tolerate anxiety and negative emotions. When a student is able to manage emotions the increased focus supports academic success. Attendees will be introduced to a variety of self-administrable Mindfulness Techniques.